Don’t text while driving. Oh, and now you should probably avoid the temptation to monitor your mainframe while driving. We previously looked at William Data Systems’ neat Zen z/OS network management suite that allowed for mainframe monitoring from the iPad, and asked a company rep whether there would be future support for other platforms. That wish has been granted with the Zen z/OS network management suite being ported to the iPhone, amid growing use of the smartphone in the enterprise. According to Williams Data Systems, the product is being demoed in Boston this week at the IBM System z Technical University, and should be available soon. The mainframe monitoring process on the iPhone will be similar to the iPad unit, and the even smaller size than the iPad and ease-of-monitoring was key in the rollout of the software. 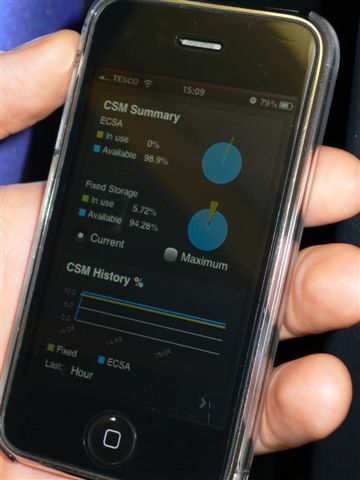 “Its portability means that a z/OS support person can receive system network alerts on an iPhone in their pocket, receive simplified diagnostic graphics and run a reduced range of diagnostic routines until they have access to an iPad or PC,” mentioned Graham Storey, Vice President Marketing, William Data Systems.